Hey gang! It's been a while since I've been here to chat, and for good reason. I've been working along with the amazing Immortal Ink Publishers to get these two new books ready to roll. These are stories near and dear to my heart. Long before I started writing novels, I was crafting short stories. Stephen King said, "A short story is like a kiss in the dark from a stranger." And with a huge collection to his credit, he would know, wouldn't he? As a longtime fan of short story queen Ms. Alice Munro, I'm thrilled to be seeing my own short stories come to life. It’s a first love unfinished, a family bond tested and forged. It’s a young woman staring at the messy underside of her dreams, and another facing a future she hasn’t chosen for herself. We meet an alcoholic country singer trying to be a father, a child who may never hear the beautiful sound of his mother’s voice, a fallen hero’s daughter, a stray who stays, and so much more. In PETIT FLEURS and its companion VIGNETTES, we come to know fascinating and flawed people from all over the world, each with a unique story to tell - scenes of life shown throughout the years. Secrets exposed, tender hellos, and tumultuous goodbyes. 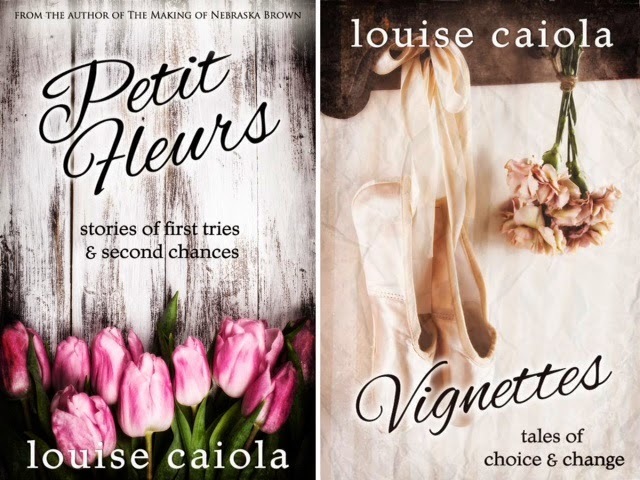 In this multi-faceted two-book collection of short stories, Louise Caiola captures those defining moments that challenge and change us, those that serve as the catalyst to our greatest experiences, our dearest memories, our deepest joy, and perhaps our sincerest sorrows. We anticipate the release to be sometime in September 2014! Naturally, we have a party and special giveaway planned just for you! Stay tuned for more deets to come. And, of course, I hope by now you've read or have added THE MAKING OF NEBRASKA BROWN to your TBR list.